Sprinklr, the unicorn startup with a valuation of $1.8 billion, announced a major update today, which shifts the company’s focus from a pure social signals platform to customer experience management. 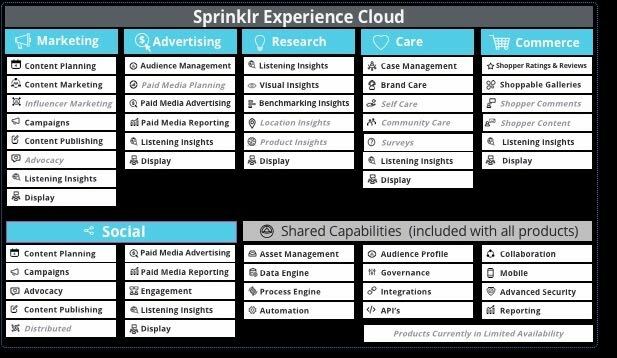 While it still uses social as a central processing point, the idea is to bring a typical set of marketing tasks under a single umbrella they are calling the Experience Cloud. If that sounds familiar, it’s because Adobe released a product with the same name a few weeks ago. Sprinklr is taking a similar approach with a unified platform, but with the goal of being able to manage the customer through what you know about them from a social perspective. For CEO Ragy Thomas, it’s about finding more creative ways to use the social information they have been collecting for the past 7.5 years the company has been around. The newly expanded platform adds five modules including marketing, advertising, research, customer care and eCommerce, in addition to the social component that has been at the center of the company’s approach up until now. It’s worth noting that the company released the platform notion in 2015, but it had just the social piece back then. This is an entirely new bundle of options, according to the company. Being a platform play, as you would expect there is a set of shared capabilities underpinning each of the categories such as asset management, APIs, reporting, security and collaboration. Thomas doesn’t actually see his company competing with Adobe’s product in spite of the identical names. Instead, he sees it as complementary, something that could work alongside Adobe’s offering. “When you think about Adobe’s Experience Cloud, when you take their core offering, they’ve got content creation capabilities, web management, web analytics and campaign and email capability,” he said. He contrasts that with the offerings on his platform. “For influencer marketing, we have included content marketing, listening insights, visual insights and community care. These are things you don’t find in other places,” he claimed. Many of the platform pieces came by way of acquisition. 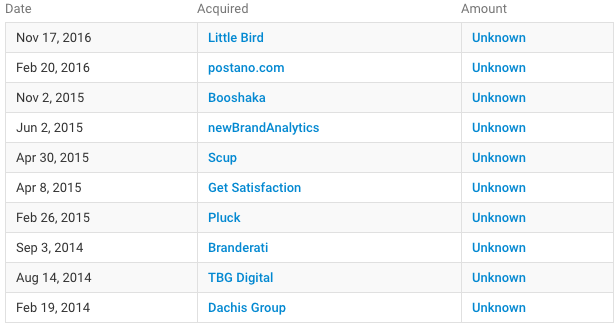 Sprinklr has quietly purchased 10 companies since 2014, all with the ultimate goal of building out the social signals platform into something more. The company wants to give customers this broad set of tools to help manage customer experience across a variety of roles. Thomas believes that each platform category can feed off of the social information, whether that’s an ad you’re delivering to the customer or a product you’re selling them online. There’s no doubt it’s ambitious and is attempting to take the company in a much more extensive direction. There has been chatter over the past couple of months that Sprinklr itself was an acquisition target. When asked about this Thomas would only say, “We’ve not been commenting on that.” He added, “In our history, we’ve passed on multiple acquisition proposals.” For now at least, today’s release signals that the company is not sitting still waiting to be bought. Thomas sees customer experience management, a notion that has been around for some time, finally beginning to take off, and he believes this new platform puts them in a position to capitalize on it.